The Pond is Cleveland’s family owned and family friendly ice rink. The Pond is 4,000 square feet of fun. The facility is the only wind turbine powered Ice Rink in Ohio. We are a top notch skating facility for all ages and abilities. Public skating can be enjoyed Monday – Friday from 12 – 2 pm and Friday PM Skate from 7:10 – 8:40 pm. Weekend public skating Saturday and Sunday 1:30 – 3:00pm. Admission is $6 ( under 5 is FREE admission) all Skate Rental is $4. Always check the Ice Schedule on our home page for the most up to date information. 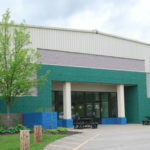 Come tour the inside of our facility for figure skating, hockey, broomball and parties, then head outside to see the turbines!